What Is Missing In Pelicanland? We here in Northern California rightly pride ourselves not only on the quality of our lifestyles but the quality of our rugby and that goes hand in hand with the quality of our referees. The good referee makes a bad game good and a good game better. So that begs the question, with all of these factors in our favor, what is missing in Pelicanland? Naturally, the answer is The 3 Rs: Rain, Referees, and Rithmatic. The lack of rain is well documented and after a series of December storms the drought patterns have reasserted themselves. Another seasonal pattern is a lack of referees. Once the calendar turns over leagues across the land start up and we need referees to cover all of these matches. Please go to assignr.com to confirm your availability and matches, or if you haven’t received an assignr.com account, contact Pete Smith at me@petesweb.com to let him know you are available. To get an assignr account please contact our Scott Wood at rscottwood@gmail.com . He will get you all the information you need to sign up and announce your availability. “Rithmatic” is, of course, just folksy math and frankly I feel we are better off at a penalty not asking players to retreat “no further than Old Man Wheeler can spit a wad o’ tobakky”. As is known throughout the land of the flying, double-chinned fish snacker, the most wanted referee’s in America are in Northern California. We have been asked to spread out knowledge of the game to Las Vegas for the 2015 Las Vegas Invitational presented by The Riviera. The Las Vegas Invitational — the largest rugby tournament in North America — will take place February 12 – 14, 2015 and will be played alongside the USA Sevens international rugby tournament held annually in Las Vegas. The LVI is considered the premier amateur rugby events in the United States, featuring athletes and match-ups across a wide-range of rugby divisions and age groups. All referee’s that participate will receive a new 2015 LVI jersey, 3 day tickets to the USA 7’s and have the option of the best rates in town at the Riviera as well as a 4 day shuttle pass to get to all the LVI and USA 7’s matches. Although we could put a monetary value on this, many consider it priceless. The referee management would like to hear from you asap but please no later than January 31 to make sure we have a proper ticket, pass and jersey count. Please contact Autumn Arvidson at mnrugbyref@gmail.com or 612-859-6439. Copy the link and have it available on your smartphone. If you have an Iphone add the link to your home screen. when needed fill it out and click submit. The discipline chair of the competition you refereed will receive a notification about the incident. He/she may contact you latter for more details. 14) Two defenders joining a ruck drop their heads and shoulders lower than their hips. What should the referee rule? Referees and other interested parties have asked what Option 5 is. Option 5 is an option that is only available to Top Referees and should be only used by said Top Referees. Simply put, if you don’t know what Option 5 is then you shouldn’t use Option 5. We will know if you do. (b) Cotton blend long tights, with single inside leg seam under their shorts & socks. Referees need to be CIPP’d too! Don’t forget to get registered with USA rugby. Once you’ve registered send your society dues, $10.00, to Jim Crenshaw. His address can be found on pelicanrefs.com as well as baldandbeautiful.com. On To The Game Reports! John Coppinger and I split up the five games in a mini tournament hosted by Baracus. It was a beautiful sunny and warm SF day with no (cold) ocean breeze. Baracus fielded two teams, the other two teams were from Chico State and Stanford Graduate School club. Each half was 20 minutes, with a 5 min., half-time break. As it was a pre-season warm-up, fitness seemed to be the main factor, especially in the second half. A lot of the games were close and it appear there were several players in each team who were new to rugby. A good day for all. This was 3 team mini-tournament with short period. Perter Sandhill did two matches and I did three. Stanford GSB 14, Baracus 14. Yes, another tie, but not my fault. Baracus was up by 7 with 1 minute remaining when SGSB committed a penalty infraction ten meters from their own try-line in front of one the posts. One of the Baracus locks (who had already displayed a dubious grasp of the laws of the game) quickly tapped through in front of the far post. I whistled play dead to bring him back to the mark. Incensed, the lock slammed the ball sending it 15 feet back into the air on the rebound. I reversed the penalty; SGSB tapped through and went 90 meters to score in front of the posts and tie the match at full time with the conversion. Why should I owe beers for a fool’s poor decision making? EDITOR’S NOTE: Your thoughts on a tie were rejected last week – why should this week be any different? We will expect suitable beverages at the next meeting for both results. Toughly contested match. Napa surprised Colusa with a lead at halftime, with a lot of head-knocking forward play. Colusa was able to have some long breaks at the wing that Napa couldn’t match. Both teams had trouble staying on their feet in the loose play, which was handled with a combination of management and penalties – chalk it up to early season cobwebs. Primarily a soccer field synthetic surface but EPA Bulldogs did a good job marking the rugby lines making good use of the existing markings. Prematch team boot inspections and captain coin toss and chat were concluded 40 mins before kickoff allowing the teams to be unhindered in their pregame routine. I was supported by Nome Tiatia (NCRRS) and Antoine ? So without an official team of 3 we had a good pre game session covering the core roles they needed to support. The game started in sunshine with no wind of significance and it was clear both sides wanted to play open ball in hand rugby with some direct straight carries mixed in. As was to be expected the contact area was highly contested but both captains had heeded the prematch discussion and there was early good discipline at the ruck and maul offside lines with only one early penalty. 10 mins in and we had the first score with the Razorbacks getting in by the posts to allow an easy conversion for a 0-7 lead. They continued to dominate the next few minutes but good defense from the Bulldogs kept their line intact. After their period of defending the Bulldogs got some field position and on 20 mins got in for a good score after a few wide back line moves. Successfully converted for 7-7. Having got the score the Bulldogs had the better of the next 10 mins but at key times the Razorbacks forced errors for turnovers to relieve the pressure. The pressure eventually told after first conceding a penalty for offside which gave field position to the Bulldogs they then conceded a kick able penalty for off feet at a ruck. This was converted for a 10-7 lead on 31 mins. Play balanced out with both sides putting in some strong defensive tackles to Halt momentum. With half time nearing the Razorbacks upped their effort and scored a multiphase try wide on the right which they failed to convert. In the first half some judicious words with the two captains dealt with some unnecessary banter between a few players from both sides and there were no further issues as it was clear how I would deal with players if it repeated. The second half started with the Bulldogs quickly on the attack but a long left to right multiplayer skip pass was picked off by one of the Razorback forwards who just made the try line by the posts from the halfway line. Successfully converted for 10-19. Visibly impacted by this score the Bulldogs attacking efforts faltered through some loose play with turnover; knock ons not helping them. While this gave the Razorbacks some good field position the Bulldogs defensive play remained strong and they kept their line intact and started to rebuild their momentum. Having brought themselves back into the game and pressing for a score another skip pass was picked off by the Razorbacks but this time it was one of their backs and he streaked away to score under the posts. The conversion straight in front was missed which brought some humorous comments from the supporters. (10-24 on 13 mins). The Bulldogs kept up the pressure in an effort to close the score and the Razorbacks conceded a number of penalties in quick succession for side entry at the breakdown leading me to issue a team caution to their captain on 18 mins. A few plays later, a just arrived substitue repeated the offense and received a yellow card on 19:54. With the extra man the Bulldogs looked to increase the pace but a phase of play broke down when on the attack. The ball was gathered by the Razorbacks and they relieved the pressure with a huge kick down the middle of the field which the kicker aggressively chased. The first high bounce took the ball away from one Bulldogs defender and the second bounce kicked wickedly away from the second closing defender with the ball falling straight in the hands of the chasing Razorbacks player who went straight in to score 10 yards left of the posts. The conversion was missed. (10-29 on 22 mins). With the extra man the Bulldogs kept the pace up but the Razorbacks put in some very strong defense to hold them out. With some players tiring substitutions were introduced regularly between 55 and 70 mins. They kept pushing in the remaining minutes but the Razorbacks held them out with strong tackling giving them 2 turnovers and play moved back to the Bulldogs half. Following a knee injury to one of the Razorbacks backs the Bulldogs spent the last minute on the attack put play eventually broke down with a knockon to leave Razorbacks victorious on a 15-29 score line with a bonus point as well for scoring 5 tries. A good physical game of rugby played at speed was an enjoyable way to start the 15s league season. Also a mention for Nome and Antoine for good TJ support throughout. Fresno played very well on their side B game vs their A game. Fresno first try and converted with in 7 minutes of the first half. San Jose use the ball very good and manged to have 12 points. Both team decided to do only 20 minutes half game. Humboldt play on what must be one of the worst fields in Northern California (they have apparently done the paperwork for a better field) and by way of putting lipstick on a sow, they have one of the best sets of portable goal posts – tall, metal and quickly installed and removed. Said posts were installed by 12.30 and so there was plenty of time for the home team to warm up for the 1pm kick off. If the league games were 20 minute halves, then Humboldt would compete well. This was demonstrated by their 5-0 lead at half time, in a half where defensively they kept Mendocino narrow and offensively battered with some big carriers. As Humboldt tired quickly in the second half, Mendocino were able to get quicker ball from the break down and this ball went wide very productively. Mendocino ran in 6 tries (4 conversions) to no response from Humboldt for a 38-5 final score. After 80 seconds of play, a Silicon Valley forward falls to the floor in pain. Everybody around heard something cracking, and we knew that he had broken something. The ambulance arrived a couple minutes later, and took him away. I wish him a good recovery, and hope that he’ll be back on the pitch soon. The team only had 15 players there, so they restarted the game with only 14 players. Unfortunately for them, two more players got injured in the first half, and there quickly were playing at 12 against 15. Modesto easily led 33 – 5 at the half, despite their full back being sent off for misconduct. At the beginning of the second half, after 3 tries by Modesto in the first 7 minutes, SV captain asked if they could borrow some players from the Modesto team. This was accepted, and the game restarted between 2 teams of 14 players. But this didn’t stop Modesto, who scored many more unanswered tries. I’ve been refereeing here for about 8 years now, but this was my first ever trip to the legendary For Pete’s Sake field in Santa Rosa. I took advantage of the journey to stop off for a swift 40 miles on my bike along the shores of Berryessa, which was beautiful and importantly devoid of other people. Nice ride. Made it to FPS in time to see Scott Griffin finishing up the early game — no doubt about who is in charge when you hear his whistle tone. Pitch itself was as good as it gets: nicely crowned, lined precisely and with huge great tree trunks for goalposts. None of the usual deciding whether the kick is good when it passes over a crooked post, that’s for sure. Game wasn’t as good as it gets, but was fun for all regardless. It was a preseason affair — both teams had their issues. Santa Rosa’s kicking game was perhaps in need of a little work (3 direct to touch, and at least 4 run back for tries), and Life West’s scrum was distinctly vulnerable. And your correspondent also had a few problems. Ball in the back of the head (all my fault). Law error (backs offside at LO — penalty mark 10m up, not on line of touch. Duh.) Management in need of improvement (too many players on the ground with a lax early standard paving the way for a messy second stanza.) All learnings, which is why preseason is a good thing. As for the game itself, it was close until the half, when Rosa took off a few of their better players, then the visitors ran a bunch of tries in from back moves. The left wing in particular (name I carelessly omitted to obtain) scored 4 tries from deep. Teams giving these guys room to run will pay the price! Fun day out. Hopefully it won’t be another 8 years before I get to return. In a shortened second game, largely because Santa Rosa was short on numbers??? ?, the game was back and forth with two evenly playing rugby teams. Life West used bursts of speed to outrun Rosa’s backs and Santa Rosa seemed to hold more than their own in tight play. A beautiful day to play rugby in Santa Rosa, with three games and a lot of food, at the field, afterwards. Thank you, Afa ! Great season opener for South Valley, and quite the showing for Google’s first league match. South Valley looked like they would take the entire game, scoring two tries in the first half making the score 10-0. Google answered back with two tries in the second half and got the first conversion of the day. South Valley rallied back toward the end of the game and managed two more tries – one of which included a conversion to round up the score of 22-12 in favor of South Valley. The score speaks for itself, so the venue will get most of the attention in this report. St. Mary’s have moved their rugby field this year, from the already excellent Pat Vincent Memorial Field, to the old football stadium at the top of campus. There is seating for 3,500, a press box, warmup facilities and many other benefits of the stadium. The ground is very firm, but flat and excellent for rugby with 15+m in goals. The match was somewhat competitive for about 30 minutes, with two contrasting styles of play. The Utes only really had the option of a pick and drive offense, which made hard going of it early on, but were rewarded with two tries. However, the Gaels, like last season, were experts at turning defense into attack by stripping the ball out of the tackle and counter rucking. They would quickly find their centers, full back or wings and score quickly while the opposition defense scrambled to line up. SMC still look good and appear to have shaken off some of the pre-season rust. EDITOR’S NOTE: This is a sad day for me personally, though a good day for St. Mary’s rugby. You see, I was the first person to score on the Pat Vincent Memorial Field. When the field first opened the Gaels hosted UCSB in a preseason match and after about 10 minutes I went over for a try… I no longer have that distinction. Tempus fugit. On a perfect day for rugby, we played the inaugural rugby game on the St Mary’s new pitch. Cal Maritime vs SMC was a fast paced and quick game. The first half was close with both teams scoring 2 tries, but SMC opened up the scoreline quickly in the 2nd half. In the end, SMC looked much stronger and played together in open play versus their opponents. After enjoying Saturday’s Div 1 EPA match-up it’s was up bright and early to meet up with James Hinkin and Jen Tetler for day 2 of the Stanford Women’s Invitational 15s tournament and a 9:00 start. Jen and James had done the hard work with the pool games on day one so it was down to the playoff stages on Sunday morning. James ref’d the first consolation pool on Pitch 2 with Oregon defeating Chico State fairly comfortably 23-5. While this was going on Jen had the first main Semi on Pitch 1 between UC San Diego and UC Davis. Davis dominated the first half territory and kept San Diego in their own half for virtually the whole time. Despite the dominance they only scored one unconverted try to lead by 5 at half time. Davis continued to have the best of the second half but as their players tired a little in the final minutes San Diego started to get some space out wide and first crossed for a converted try on the right with 3 minutes to go. Shortly afterwards the got around the Davis defense wide on the left and scored another try, unconverted, to win by 12-5. I started my days work with the second consolation semi on pitch 2 with UCLA versus Western Washington who were one of the 2 winless teams from day one. A scoreless first half was played mainly between the 22s with both sides putting in a lot of effort but some poor handling skills giving turnovers on a frequent basis. Washington were playing a simpler game plan recycling close to the breakdown while UCLA occasionally looked to spread the ball wide. As the first half progressed Washington’s stronger scrum was disrupting UCLA’s possession more and more. Early in the second half the direct close in play of Washington brought them just outside the UCLA 22 and from a scrum they recycled 4 times to go in for an unconverted try for a 5-0 lead. UCLA then had a few minutes of dominance but never really threatened a score. Shortly before the end Washington again held position for multiple phases and UCLA ran out of defenders and conceded another unconverted try. Washington were delighted with their first win of the weekend at the final whistle. While I was reffing this game, Jen was doing the second main semi final between CAL and Stanford. I cannot say I saw any of this game but thanks to the enthusiastic home match commentary and passionate announcer!!!! I have no problem in remembering that Stanford scored 3 tries for a 15-0 victory. With Jen having completed her two day shift at this point, James who at this point had refd Stanford 3 times already scheduled himself for the Davis v Cal 3v4 playoff and the consolation final Oregon v Washington and I ref’d the consolation consolation match between Chico St and UCLA before the main final between Stanford and San Diego. Cal defeated Davis and Chico St much to the delight of their players and small traveling support finally won a game by reversing the Saturday pool result by beating UCLA. As Oregon and Washington had also played each other on Saturday they took the opportunity to waive their final match to save a couple of hours for their long trek northwards home. James’ knee was happy with this decision!!! The final between Stanford and San Diego developed into an exciting fast game with both teams looking to move the ball quickly at every opportunity. Stanford favored moving the ball wide whenever possible with San Diego attacking the mid field area through their centers. The first half territory was dominated by Stanford and they deservedly built up a 3 try lead, each excellently converted for a 21-0 lead after 16 minutes. San Diego were playing quite well but mostly defensively with only the occasional breakout towards the Stanford 22. The half finished with continuous play lasting almost 4 minutes where Stanford recycled well in excess of 20 times while San Diego steadfastly defended their line. The play move left and right inside and outside the San Diego 22 and with each passing phase the crowd became more involved and vocal. The half finished with the Stanford right wing driving for the corner with 2 San Diego defenders holding her up over the line and just driving her out in touch in goal. San Diego started the second half strongly and recycled a few phases deep I to the Stanford 22. Stanford with held the pressure and on gaining a turnover ran the ball deep into San Diego’s half. They recycled and got in for another try which surprising went unconverted after the excellent kicking display of the first half. 26-0. There were a few minutes of midfield play with the defenses on both sides causing turnovers but gradually San Diego started to gain the upper hand. On 11 minutes they scored a very good try wide on the right which was expertly converted. They continued to dominate and Stanford conceded 3 “in at the side” penalties which resulted in a team warning. This gave San Diego more confidence and with 4 minutes to go they score anotherr wide out try, this time on the left. The conversion was well struck but fell short. 26-12. You could hear the anxious Stanford supporters encouraging their team to keep possession. San Diego kept pushing looking for more scores but a turnover when trying to squeeze out a risky pass led to Stanford finishing the match well inside the San Diego half and while the score board looked comfortable at 26-12 they knew they had earned their victory. The day finished with James presenting the medals and cup to the victorious Stanford team!!! The Annual Stanford Women’s Invitational was played under crisp, sunny skies on Saturday and cold, cloudy skies on Sunday. Teams participating were Stanford, Cal, UC Davis, Chico St, UCLA, UCSD, Oregon and Western Washington. The first day was a sorting out with pool play and Stanford managed to win all of their matches without giving up a point. Yes, their defense is that good. Teams would get chances and put Stanford under pressure, but they never broke and made the tackles when they had to until a turnover relieved the pressure. Twice on the weekend they ended a half with the ball held up in goal and that was no accident – the ladies knew where they were on the field and swarmed the ballcarrier so that she couldn’t ground the ball. UC Davis also impressed with a couple over very dynamic players. They have a hard running center who uses her fend well and is very tough to bring down as well as defensively being a ball thief at the breakdown. The Aggies also boast a flanker with possibly the best pace in the tournament who will run right at a defense and with one sidestep will be beyond and off to the races. UCSD was the team that gave Stanford their biggest test, appropriately in the final. After losing 28-0 in pool play UCSD learned and regrouped to make it back to the final where they once again went down by 4 tries. 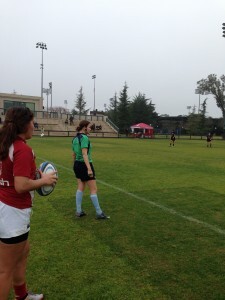 This time they stormed back in the second half to score 2 tries of their own and kept Stanford under constant pressure. A couple of try saving tackles prevented the Southern Californians from completing the comeback and Stanford took the final of their own tournament yet again. Many thanks to the teams and organizers – especially Matt Sherman – as well as referees Jen Tetler, John Lane, Bryant Y. Byrnes and Aaron Nelson. This entry was posted in News on January 15, 2015 by James Hinkin.